Software designed by Pharmacists for Pharmacists. 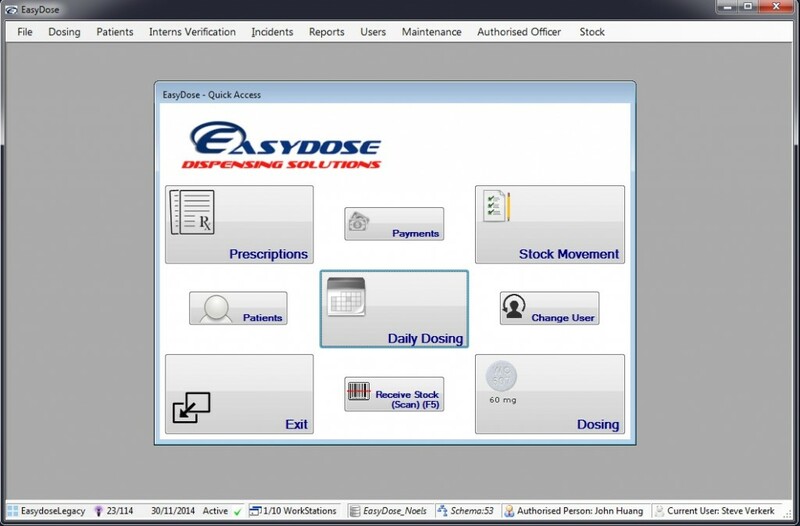 EasyDose takes care of the clerical work involved in the daily dispensing of the drugs Methadone and Buprenorphine to opioid dependant clients. It replaces the antiquated method of paper based records saving both time and money. Electronic dose recording made quick and easy. Comprehensive patient, dosing and prescription details at your fingertips. Extensive Payment system with detailed reports. Client photos and prescription images right there on your screen. Instantly produces take away labels. (In-store labels optional). Easy reporting of the data entered with a myriad of reports available. Speedy compilation of Monthly Returns to the Health Department which can be printed or emailed. Provides an instant, template for Incident Reports which can be printed or emailed. Ability to use Fingerprint Reader for both the pharmacist and patient identification and verification. Ability to have clients sign for their doses with a Signature Pad. Scanning of barcodes for speedy entry of incoming stock. Stock-takes made quick, simple and easy.